Are you looking for useful educational apps for iPad/iPhone ? This article can tell you the best Maths apps for iPad/iPhone device. These apps would be very useful for educational purpose and if you want to solve your Maths questions easily, you can try any of these useful Maths apps on your iDevice. Check out these useful apps. 1. WolframAlpha ( iPhone & iPad ) – Great math app for iPhone & iPad that comes with tons of features. One of the most useful mathematical app for your device and it is integrated with lots of useful functions with large collection of algorithms. Very useful app to find answers of mathematics, physics , chemistry, engineering , astronomy, earth & life science, current and historical weather, geography , place and people. Fully featured educational app for iPhone and iPad users. You can solve all types of maths problems because the app covers all types of maths such as Elementary Math , Algebra ,Matrices ,Numbers ,Calculus ,Trigonometry, Geometry , Logic Functions and more. 2. Math Fact Master ( iPhone & iPad ) – One of the best Math apps on the App store and it helps students solve math problems easily from iDevice. The app includes lots of features and helps you learn maths easily. The app comes with lots of features such as flashcard mode for math practice, challenge mode for exam, profiles option to monitor every students progress, and many other features. Recommended Mathematic app for students. 3. 3rd Grade Math ( iPhone & iPad ) – Fully functional Math app for your Device that can help your kid to learn Math easily. One of the best ways to practice math with fun. This app has beautiful and easy to use interface that can help student to learn and solve math problems quickly. 3rd Grade Math comes with 16 chapters , 200 Math skills and tons of math problems. One of the best math apps and it is integrated with many education features including interactive content with clean user interface, useful practice mode, fun math games, weekly progress reporting feature and scratch pad for rough work. If you have kids, you must have this app on your device. 4. Quick Graph + ( iPhone & iPad ) – Beautifully designed powerful graphic calculator that can be used as a useful math app on your iPhone or iPad. This app is integrated with tons of features which can help students to solve mathematical problems quickly. Fully featured beautiful and powerful graphic calculator that has many features such as unlimited graphs, 2D & 3D equation plotting, in-app email to share equations and graphics etc. Great math app for students. 5. Mathemagics ( iPhone & iPad ) – One of the best educational apps on the app store that let you learn mathematical tricks easily from your device. If you are looking for easy to use mathematical app to improve your brain with quick practice, Mathemagics is the perfect app for you. Great app that comes with easy to learn lessons and quick practice mode. 6. AB Math ( iPhone & iPad ) – One of the best fun math games for kids. Very easy to play fun math game for kids that also comes with expert mode. Useful math game for kids from 5 to 10, that is integrated with fun game modes, fun animations and 4 gaming levels including expert mode. 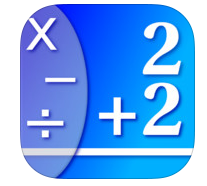 Simple and useful math app for iPhone and iPad devices.